The controlled and directional use of compressed air, utilising a tool such as an AirKnife, AirSpade or AirPick, enables the practiced arborist to sensitively explore the root system of trees with confidence. The careful and skilled use of compressed air in this way makes it possible to break up and remove the soil from around tree roots, leaving them exposed for inspection or to enable strategic root pruning operations. The tools used convert compressed air from a portable compressor to a directional jet stream through a special nozzle fitted to the end of a hand held lance. The finely focused stream of air penetrates the ground to a depth of up to 30cm and can be aimed to crumble and blast the soil away as fast as the operator moves the tool. Since tree roots, rocks and pipelines are non-porous soil can be excavated quickly with no impact on electrical or gas lines and minimal harm to roots. In the hands of an experienced arborist using sympathetic skill and care it is possible to expose tree roots with their mycorrhiza still intact. However, it is very important to be aware that persistent use of the compressed air stream in the same locations can dislodge the fine roots and their associated fungi, while it is also possible to cause damage to the root cortex of thin barked species. Another cautionary note when using these tools around tree roots is that the compressed air produced by most standard road compressors will contain a small proportion of what are known as ‘crack oils’. This release of oil occurs as part of the compressors lubrication process and the compressed air produced contains on average 5-10 parts per million. This is not considered to be an issue for normal operational needs, because these compressor units are designed to power tools that utilise the compressed air flow to operate an implement such as a ‘jack hammer’. However, when the compressed air is channelled through a hand held lance to enable to excavation of soil around tree roots or pipelines, the ‘crack oils’ it contains would be released out in a fine mist. It is therefore important to install filters in the air line between the compressor unit and the hand held lance. Using two specially designed filter units it is possible to reduce the oil content of the air stream down to a more acceptable 0.05 parts per million, and this is essential when the excavation work is concentrated around living tree roots. The use of compressed air excavation tools opens a new world of tree care. For the first time arborists can work with the underground portion of the tree and look closer at the interaction between tree roots and the fungi living with them. It is easy to jump to a conclusion that fungi growing at the base of trees are evidence of decay in the trunk or main root system of the tree, without considering that they may just be living off the dead wood where the oldest tree roots have become dysfunctional. Using the high pressure air stream to break up and blow away the soil from around the base of trees it is possible to look in more detail at the roots which might be affected by the fungi, while also being able to assess the effectiveness of the reactive growth being produced by the tree. By undertaking such a revealing investigation it becomes possible to make more informed management decisions without employing invasive decay detection equipment. Using similar exploration techniques it is also possible to expose utilities such as gas, electricity or telephone lines that may be entwined with the roots of the tree. This could be essential investigative work before undertaking stump removal operations either with a stump grinder or mechanical excavator. A little investment is preparatory work like this can save a lot of extra costs and inconvenience if utilities were to be damaged, not to mention the potential for more catastrophic incidence that could be life threatening. The use of compressed air excavation tools makes work around underground utilities much safer for operators and trees. The air tools can be used to locate gas and power lines before digging with mechanical excavators. It can dig a utility line tunnel under a hard surface like pavements or patios as easily as under tree roots. Where it becomes necessary to excavate a trench close to or under the canopy of a tree, these tools can be used to expose roots that may then be either bent out the way of the trenching work or cut back using target pruning. This reduces the stress caused to trees by preventing roots being ripped out the ground by a mechanical excavator, therefore prolonging the trees life expectancy and enabling the retention of trees that may otherwise have been removed. 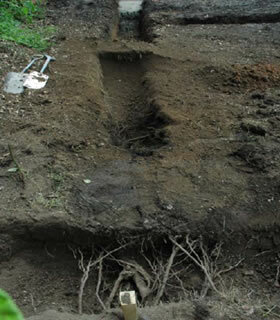 Using similar techniques it is also possible to explore the rooting area of trees prior to the installation of hard surfaces or building foundations. Where planning conditions, or the arboricultural method statement, specifies the use of specialist foundation techniques such as; pile and above ground beam, pad and beam, or canter leaver designs, it is important to find where the tree roots are so the most sensitive installation can be achieved. However, it is essential that all work to expose tree roots be undertaken by qualified arborists with knowledge of tree physiology and ecology, although, the tools themselves are easy to operate and could be used by groundwork contractors during other excavation works. Once exposed the tree roots will need to be treated with care and if left exposed for any length of time they should be covered with wet Hessian or sprayed with a hydro-jell to reduce desiccation as a result of water loss, while mulch can also be used to cover exposed roots during excavation work. Soil compaction is widely recognised as one of the most significant stresses associated with trees in urban environments, especially in association with development, while also being an issue in well used parks and gardens. Compacted soils have very few macro pore spaces that normally hold air and water, while also limiting the growth of fungi that form mycorrhizal associations with their roots. This has a dramatic influence on respiration and severe compaction can suffocate a tree. With the controlled use of compressed air, radial trenching out from the trees trunk can improve root growth. This is made easy when the compacted crust can be blown away and replaced with improved soil with a high organic material content. In addition, vertical mulching with the compressed air lance can break through the soil horizons to improve drainage and encourage the development of a more structured rooting environment around the tree. The results of such work dramatically improved soil biodiversity and can have a significant impact on the longevity of the trees.